Act of Valor (2012) was a movie that got a bit more press than it might have normaly got due to the fact that the movie used real Navy Seals. This is a good action film – not a great film, but a good action movie. So, the Seals are used to extract a kidnapped female operative that had been posing as a doctor, helping poor kids in Mexico. Add to this the fact that the kidnappers are working with a Georgian (in Russia, not the Southern U.S.) Terrorist who plans on having 16 suicide bombers detonate themselves in 16 different locations in the U.S., using high tech, undetectable suicide vests, thereby plunging the U.S. economy into chaos. 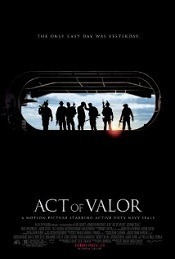 So, in short, if you want to watch a good, military action film, check out Act of Valor. 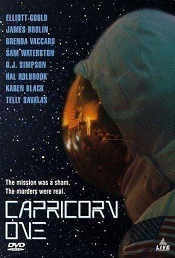 I first saw Capricorn One as a kid in the theatre with my then best buddy, Craig, more or less on a whim. As kids of 8 (or so) years old we often based our movie choices based on the Movie poster – this was no different, except we liked this one. I liked it even more, watching it 35 years later. Capricorn One tells the story of a faked, manned Mars landing. 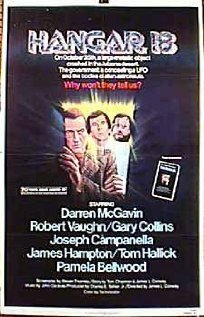 Based on the faked lunar landing conspiracies (which I do not believe -I am convinced Man DID walk on the moon), but applied to a fictional Mars landing, writer/director Peter Hyams created a (semi) believable tale of conspiracy and cover ups that keeps the audience watching and waiting. The story goes something like this: Just minutes before the launch, the crew of Capricorn One, the first scheduled manned mission for Mars, the three man crew is pulled from the capsule and secreted away to an abandoned military base, while the rocket is allowed to lift off without crew. Once at the military base the astronaughts (played by James Brolin, Sam Waterston and O.J. Simpson) are briefed about a problem with the life support system that would have left them dead within two weeks of launch, and that they would be required to act out parts of the mission here on Earth. It’s argued that this is the only way to save the space program and American pride. When they don’t immediately agree to the plan, their families are threatened, which convinces the crew to go along. Over the period of the “mission” a member of the ground crew notices that television feed from the crew seems to be coming from a much closer source that Mars. After bringing this fact to his superiors attention multiple times (and given a bogus excuse about issues with the terminal that he works on), he is finally “disappeared” by the powers that be… Which gets the attention of his reporter friend, played by Elliot Gould, who stumbles upon the whole conspiracy. Meanwhile, upon re-entry it is announced that the heat shield on the capsule had separated and the crew had died (despite never being ion the ship). The astronauts quickly figure out that this means that they’re going to be killed to keep the conspiracy buried. Quckly, they decide to try to escape and soon take off on a Learjet parked nearby. Unfortunately, the plane is low on fuel and they are frced to land in the desert where they head in opposite directions in an attempt to get to a major population centre thereby blowing the roof off the whole scam. If I tell you more, I’ll give away too much. Let me just say that this is a great, fun adventure, and that while I don’t believe the whole “they faked the moon landing” thing, but that this made for an entertaining film and I definitely suggest this one a s a go ahead and watch movie. This 1984 Emilio Estevez film was fun. Watched it last night, and I believe possibly once back in 1984 or 1985, as parts seemed vaguely familiar. The story of a Punk, Otto, who ends up becoming a Repo Man after unwittingly being hired to reposess a car by verteran Repo Man, Bud (played by veteran “Oh, that guy” actor, Harry Dean Stanton). Screwed over for a $1000 dollars that his Hippy parents had promised him for graduating – they gave the money to a TV Tele-Evangelist, Bud is forced to find work and decides to Join Bud and his repo buddies, who are a great set of characters. And it turns out that he’s damn good at the job, and he and Bud make a good team. 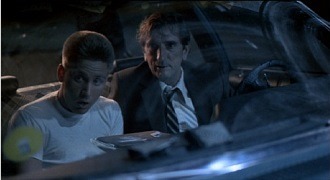 Bud informs Otto that a Repo Man’s life is always intense, and Otto loves that intensity. Along the way Otto discovers that his some of his Punk buddies have resorted to a life of crime, and meets a hot girl. Throw in a Chevy Sedan with a trunk load of Aliens and a $20,000 reward, a U.F.O. conspiracy theorist Miller, (working as a mechanic for the repo company and played by veteran character actor, Tracey Walter – you’ll know who he is when you see him) and some funny and interesting writing, a bizarre, but fitting ending and you end up with a movie well worth watching. a seasonedrepossession agent, or “repo man”, working for the “Helping Hand Acceptance Corporation” (a small automobile repossession agency). Although Otto is initially disgusted by the concept of repossessing cars, his opinion changes rapidly when he is quickly paid in cash for his first “job”. Otto joins the agency as a repo man himself. If you haven’t seen it, do and if you haven’t seen it for a long tome then see it again. 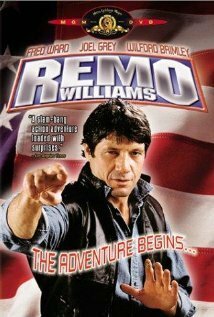 Well, we watched the 1985 action film Remo Williams, the Adventure Begins, last night and like a number of these films I’ve watched over the last few months, I find myself asking the question: why have I not seen this movie earlier. Based on the paper back book series, The Destroyer, the film is a bout a police officer, Sam Makin (played by Fred Ward that has his death faked (without his knowledge), and is forces/recruited into a secret organization named Cure that gets justice against big shots that appear to be above the law. Sort of like an Equalizer against guys like Bernie Madoff. lackeys and you have a fun film. 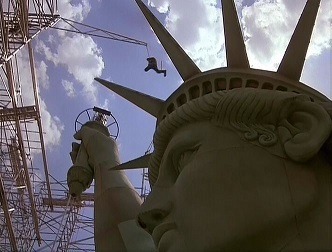 That and a pretty cool scene that takes place on and in the Statue of Liberty. One of the coolest things about this film is the fact that the good guy, Remo doesn’t use a gun – he uses his new found prowess in martial arts to defeat opponents that are armed. I say watch this film if you like action adventure films, as it really does seem fresh compared to most. I don’t think you’ll be disappointed.